If your child has been awarded a place for September 2019, your local authority will notify you on 1st March 2019. We will then invite you and your child in for a first “Welcome to Q3” Evening on Tuesday 9th April 2019 – we will write to invite you. 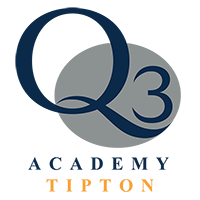 If you have not heard from us by 30th March, please email hello@q3tipton.org.uk with your child’s full name and primary school. All Year 6 students joining us this September, spend a “Transition Week” with us – the dates are Tuesday 23rd to Friday 26th July 2019. During this week all our new students will receive free breakfasts and lunches and spend it getting to know their new teachers and classmates.